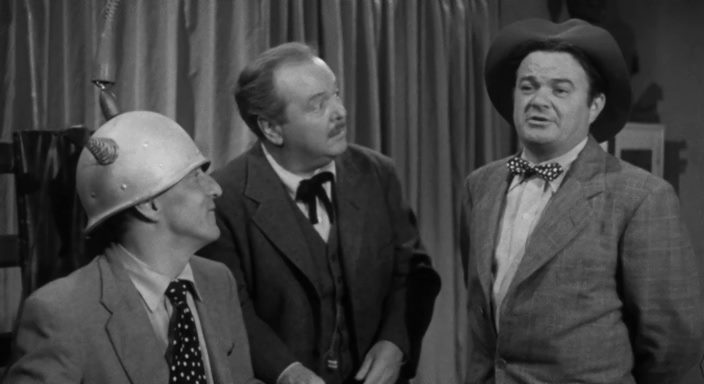 The Boys meaning Leo Gorcey and Huntz Hall specifically, continued there on screen shenanigans in this sixty-five minute effort that plays like an elongated Three Stooges short with more than a few gags and plot points I’ve seen Curly, Larry and Moe have to deal with as well. Opening up as many of the Bowery Boys features do in Louie’s Sweetshop, the duo have their hearts in the right place as usual when they set out to find a proper baseball field for local hooligans to play at. Surely that will stop errant flyballs from smashing through Louie’s front window at the shop. Louie for the uninitiated was played by Bernard Gorcey, Leo’s real life father. Leo and Huntz have the perfect location in mind situated on property owned by the strange inhabitants of a house near by. Time to go over and plead their case as only Leo can with his many tongue twisting one liners. The boys soon come to realize that the property owners are really a variation of the Addams Family with far more murderous intentions than Gomez and Morticia ever displayed. It’s a family of mad scientists and ghouls led by John Dehner. He’s a madman who is in need of a dimwitted brain to transplant into the skull of his gorilla. He’s got competition with Lloyd Corrigan who needs a head to go atop his robotic monster. Then there’s the clearly mad and flighty Ellen Corby who wants to feed the boys to her man eating plant. Laura Mason is a Vampira of sorts and has designs on the boys blood and there is even a Lerch like butler played by Paul Wexler. Tall, slow and lanky. “Walk this way please.” and here I thought that was a Mel Brooks joke! 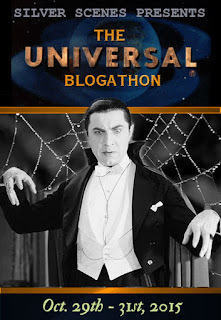 The boys get coerced into spending the night which sets the scares and monstrous ideas of Dehner and company in motion. There’s even a Jekyll Hyde potion that Wexler tries turning him into a giant Neanderthal like creature that has the boys shaking in their suits. Also wreaking havoc on Huntz and then Leo is the giant sized Robot that Corrigan controls by remote control and has Leo’s head marked for. 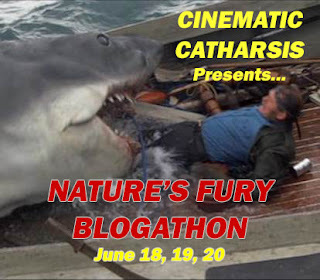 Huntz is tagged as the perfect candidate in Dehner’s search for the brain of a dimwit. 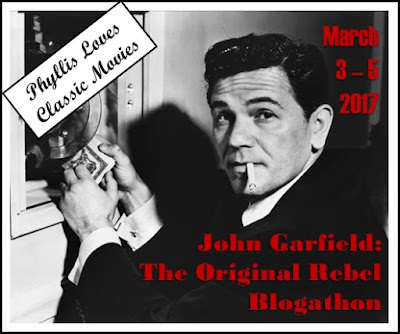 The latter half of this 65 minute special plays like a cross between a couple of Stooge’s shorts I recall, 1946’s A Bird in the Head and 1948’s Crime On Their Hands and the now classic 1948 spoof Abbott and Costello Meet Frankenstein. I know this plays for the kiddies best of all but I did grow up watching the Bowery Boys on TV whenever they came up in the listings. Mom and Dad recalled them from their youth and always referred to the boys by their screen names, Slip and Sach when talking about them. Knowing this is meant for the juvenile crowd still doesn’t stop me from wondering who is borrowing from who. 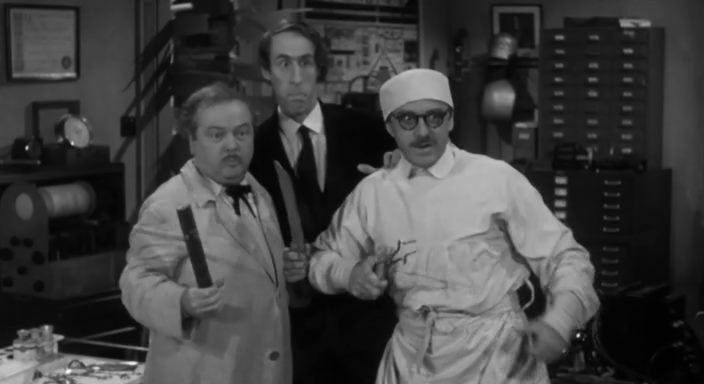 Plenty of the gags in this movie are dead on copycats of Three Stooges routines but just because I saw the Stooges do it first doesn’t necessarily mean it was their gag to begin with. If I look at the year of the release then absolutely, this one’s recycling Moe and Larry’s gag of being locked in a closet and cutting a hole through the wall to escape ….. right into the gorilla’s cage on the other side. Leo and Huntz play it exactly the same here and Leo even states a line I’ve heard one of the Stooges say that I’ve borrowed a time or two, “I stayed awake all last night to see if I snored and I didn’t.” Again was this originally a Stooges line? That’s where I learned it from ages ago so from my perspective, it’s a Stooges quote. Directed by Edward Bernds, the film also has Leo’s brother, David Gorcey returning to his role of Chuck. David has little to do here until the end when he, Louie and Benny Bartlett turn up to save Leo and Huntz from the crazies only to find themselves in peril as well. I suppose those Stooge comparisons all lie with the director. He helmed the camera for both those Three Stooges episodes and countless others during his career. He was also the credited writer on A Bird In The Head. And then there’s the writer Elwood Ullman. 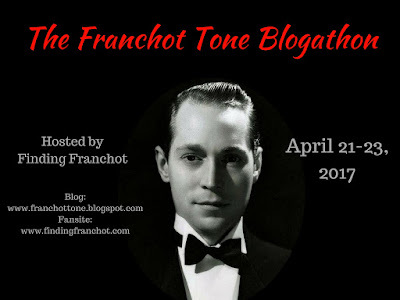 Would you believe he penned the other Stooge episode and this Bowery Boys scare fest? These guys really knew how to recycle their own work. In the end who really cares I suppose. You either like what the duo have to offer or you don’t. I get a kick out of Leo’s Cagney act and Hall gets me chuckling at times though I do wonder if some of the Bowery Boys features might have been best served as shorts of the 18 minute variety like their counterparts over at Columbia. John Dehner’s appearing in the film is a big plus. A total pro, Dehner has a huge 286 credits to his name at the IMDB. 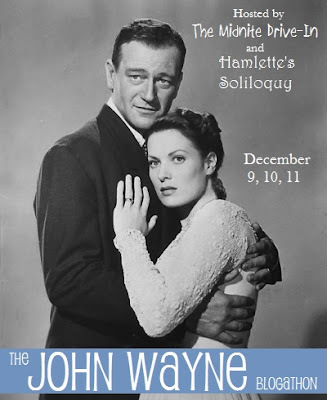 Beginning in the 1940’s he would continue to appear in TV and film up to the War and Remembrance mini-series in 1989. Like John, co star Ellen Corby has 266 credits listed and her career ranged from the 1930’into the 1990’s where she continued to play Grandma Walton into her 80’s. 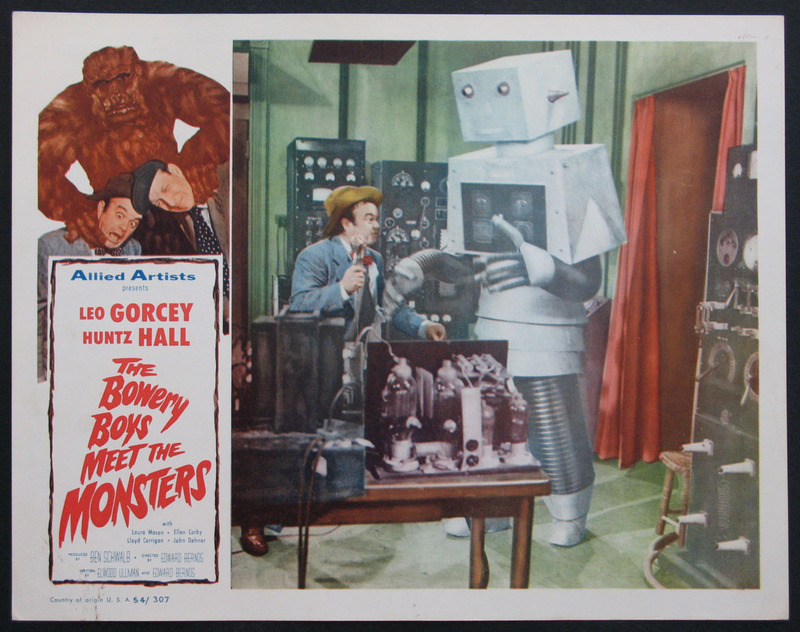 If you’re looking for a helping of the Bowery Boys Meet the Monsters, it can be found as part of the Warner Archive series that issued the Gorcey-Hall films on DVD in four volumes. A nice collection for a film fan to place on the shelf. 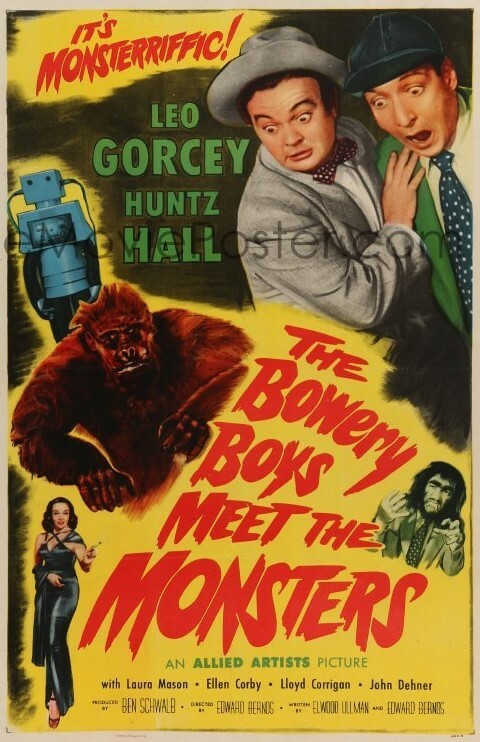 I haven’t seen a Bowery Boys film in an age. This sounds fun. And John Dehner as a mad scientist! best to watch with a youngster unless of course it proves nostalgic which it is for many of us. Even then nice to introduce a young one to the boys and their shenanigans. Casting Dehner was a bit of a surprise here. Always a welcome addition. 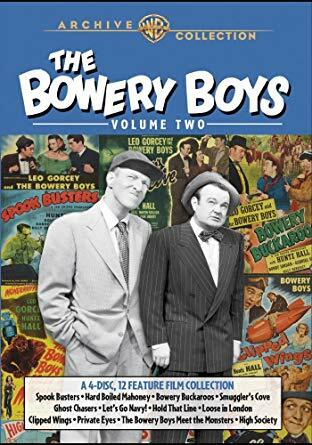 Mike, I really enjoyed your review of “The Boys.” I’ve been a fan of THE BOWERY BOYS since I first saw them on afternoon TV back during the 1960’s. I recommend GHOST CHASERS(1951) with Lloyd Corrigan as Edgar Alden Franklin Smith a 300 year old Pilgrim ghost who talks to us, the audience, as well as through his medium Sach(Huntz Hall). I think non fans will find themselves laughing at this one. I’ll have a look at that one. I have the Warner Archive volumes on DVD so I assume it’s in there. Thanks for the tip and thanks for stopping in.